This is a stunning digital flower clip art image of a beautiful, white Calla Lily. I created this digital flower image from a little Victorian paper scrap die cut. 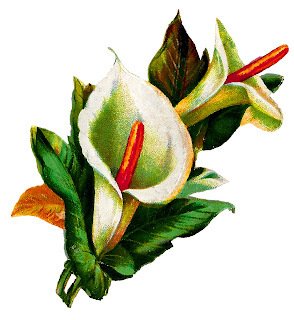 There are two Calla Lilies in this botanical artwork image and lots of big, wide leaves behind the flowers. 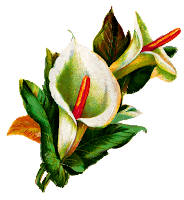 I had to do a little digital doctoring to this pretty lily clip art, and it was well worth it.